This morning GameStop.co.uk has entered into the price-war by undercutting its rivals, below. After Friday's announcement of 3DS XL, European gamers faced the standard wait to see how the device would be priced by major retailers. The recommended price in the U.S. — presumably excluding sales tax in some states — was announced as $199 (around £128) while the Japanese price is set to be ¥18,900 (just over £150). Despite these estimated prices, buyers in the UK are familiar with a trend — for a variety of reasons such as tax rates — of prices being above currency exchange rates. Initial prices on Friday evening and Saturday were varied as retailers speculated on the cost of the system, yet today it seems that major players have agreed on a price. The following four online retailers have set the same price in the UK, at the time of writing. It's entirely possible that high-street stores for GAME as well as rivals such as HMV may charge a higher cost in store, and these online prices may change. If this price holds, however, what do you UK gamers think? I'm thinking of getting one if the games will look as good as they do on the regular 3DS, but my wallet certainly won't be happy if I do... If only I could get it in purple or pink then it would be an easy choice. Wow....um...I'll pass on that one thanks..
Thats only slightly less than I payed for my 3DS on day 1. This 3DS XL thing is a hard choice since system transfer doesn't allow for splitting up the eShop games. The original 3DS is a lot more portable, but then again the larger screen would be nice for home use and some trips. decisions, decisions. I think the price will come down as the release nears. I remember loads of retailers competing and knocking down prices when 3DS released.. Some threw in bonuses too. That's $280... So the 3DS XL is a whopping $80 more expensive in the UK than in the US. And the UK one doesn't even come with a charger like the US one. Also I noticed that Play.com has listed a 3DS XL charging cradle for £19.99. I think ill wait until the the supermarkets try and out do each other and everyone else! @PeterW77 what is with the release date for the charger!? They will launch it a month later than the console? Hope you all realise you're being totally ripped off whoever buys it at this price. Its selling for $199 in USA and thats WITH a charger. We SHOULD be getting it for around £130. If trade in price for old 3DS is like £20 I'll do it, but I doubt it, so UK ripping us off as usual. This is WAY more than anyone could have expected. I expected it to be around £160, already quite a bit higher than the US, but fair considering the video game market in the UK. Interestingly, both of the regions which omitted the charger, 'to make it more affordable,' are charging more than the region that kept the charger. €225,-? Yeah, that's a pass from me. @Yasume Where do you live? Amazon Germany asks 200€ for the 3DS XL . That's before you've bought a charging adapter of course. :-/ Other manufacturers are too happy to throw those after you though, so there's no need to pay what Nintendo asks for them. Now that this (will be) released, will the price of the original 3DS drop because I prefer the original. You know, there is another currency in Europe besides the British Pound, its called the Euro? Would it hurt to include that small piece of information in your article as well? I'm kinda enticed to get this, because I sometimes find the original a little bit uncomfortable to hold due to it being so small. For those worried about the games looking awful on a bigger screen, compared to the original PSP which had 480×272 resolution and 4.3 inch screen - and it didn't look awful at all - the 3DS has 400x240 res (per eye) and 4.88 inches. Wait, what? No charger with it!? I mean come on! What if the 3DS-XL is someone's first DS? I guess it's a better chance for retailers to sell you the charger to go with it rather than bundling it in the box. Multi-selling... Come on Nintendo, I know you like to think that everyone has a DS now, but that's like saying there's 6 billion DSi/3DS units out there... Hmm... Don't know what to say to be honest. I wasn't planning on getting one anyway, but this really puts me off. Wow, it's more expensive there than it is in Australia. That's about $280 AUD and it's going to be like $250 AUD here (same price as the normal 3DS). It's ugly anyway though, just stick with the way superior original model. I may as well save $250 to get one of these. I'll probably still keep my old 3DS since it was a gift, and for multiplayer as well. If I had to choose a colour it'd be between blue and silver, but since I'd like each of my Nintendo products to be a different colour I'll likely pick silver. Method Man "Dolla Dolla Bills Yah!" thats what i need. Was going to buy one. No way at this price. Watch the UK prices tumble just before launch, they'll be offers and discounts I'm sure. I'd think about it if my 3DS breaks one day but at the current price i wouldn't get a XL then. @Burny Holland. €200,- is still a lot. 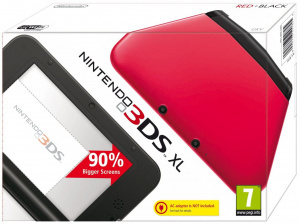 As much as I love my DSi XL, I just can't afford another 3DS ATM. I will probably pick one up eventually though. For me it would be £186.98 when I factor in how much the charger costs. That's way too much. Also, I really want to see what this thing looks like from the front and side when closed. I have a feeling there's a reason Nintendo isn't showing any pictures of the 3DS XL like this. They showed us the DS Lite from all angles because they knew it was a thing of beauty. They're not showing us the 3DS XL closed from the front or side however because they know it's ugly and they know people like me will make a point of it. If they're going to cheap out on their new 3DS XL and then try to convince us it's the best thing since sliced bread, it's very least I can do. It's all subtle marketing manipulation and unfortunately I'm far too aware of it now to just ignore it and enjoy what Nintendo is peddling. Still getting a Red + Black one a few days after launch! @antdickens I hope you're right because I really want one! @Will_Ireland Yeah, I know, but they just posted the actual prices from UK stores. Simply showing converted figures would've been misleading, since the euro prices will be higher, as I demonstrated. The only alternative model i'd buy is one with better ergonomics and much higher battery life. This oversized crap is just silly. "Even with the addition of the bigger screen, Nintendo's aim was to still make the system available at a reasonable purchase price. Because of this, and because so many fans already own a previous handheld, an AC adapter will not be included." Makes perfect sense, duh. Truth is – they must recognise the potential market for this product is low, so feel the need to squeeze extra from the few crazed people who like to buy every iteration regardless of benefit.